The Gustavus men’s hockey team saw its home opener slip away in the closing seconds of the third period in a tightly contested 4-3 loss to UW-Eau Claire on Friday evening in St. Peter, Minn. After taking a two-goal advantage early in the game, the Gusties let the Blugolds back in the mix with a three-goal outburst by Eau Claire in the second period. The Blugolds then sealed the victory with Jordan Singer’s second goal of the night with only 14.7 seconds showing on the clock in the third period. The Gusties opened the scoring with a goal by Brad Wieck off a rebound in front of the net at the :25 mark of the second period. Just over four minutes later, Gustavus’ Tim LaBombard blasted a shot from just inside the Blugold blue line that deflected off the shaft of Dane Erickson’s stick and into the net to give the Gusties a 2-0 lead. UW-Eau Claire swung the momentum back in its favor later in the second period with three unanswered goals. Singer notched the first Blugold goal on a power play at 8:27 on a hard shot from the right faceoff circle. Eau Claire added another tally on a Tyler Romasco wrist shot in front of the crease at the 10:43 mark, and Jimmy McCusker fired a shot off a rebound in front of the net at 14:32 to put the Blugolds on top 3-2. Gustavus knotted the score at 3-3 early in the third period with a Zach May shot in front of the Blugold net at the 3:05 mark. Eau Claire seemed to take the lead at the 8:06 mark when the Blugolds lit the lamp, but the goal was disallowed after the referees determined that the goal became dislodged from its moorings prior to the shot. The game appeared to be heading to overtime until Singer fired a shot from the right faceoff circle at 19:46 that found its way past Swartout to give Singer his second goal of the night and the Blugolds a thrilling 4-3 win in St. Peter. Goaltender Josh Swartout and defenseman Mitch Carlson stop a wraparound attempt by a Blugold forward. The contest was very physical throughout and each team finished with five penalties. 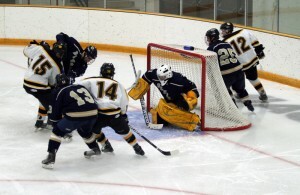 Brandon Stephenson logged 30 saves in net for the Blugolds and Swartout made 30 stops for the Gusties. May, Erickson, and Wieck each scored his second goal of the season, while Ross Ring-Jarvi notched his third assist of the season on the first Gustie goal of the night. Ring-Jarvi leads the Gustavus offense with three points on three assists. With the loss, Gustavus is now 2-1 on the season. The Gusties will host UW-River Falls on Saturday at 7:05 pm at Don Roberts Ice Rink.